Six years ago, I shared a Future Shop ad featuring my friend Mike Kic. It wasn't his only claim to fame. At the 40 second mark of Emm Gryner's video for Beautiful Things, a guy in a suit walks into an elevator. He's on a cell phone and looks rather annoyed. Click here to start the video at that exact moment. That man was also Mike Kic. 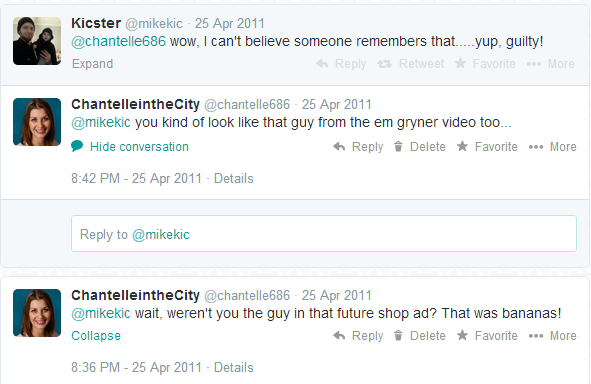 As a gag a few years ago, I had my friend CJ tweet at Kic pretending to recognize him from the obscure Future Shop ad. We had him fooled, and then I had her pretend to recognize him from the Emm Gryner video. That's when the jig was up. Thanks for sharing Mike :) One of my favourite Kic memories! I like this song a lot but never seen the video for it till now. Glad to see a little bit of Mike Kick. Peace!